Who says you can’t have your vegetables and dessert together? Combining zucchini straight out your garden and a few other ingredients straight outta your pantry you’ll be in heaven, or somewhere in the neighborhood. Start by cutting off both of the ends of your zucchini. 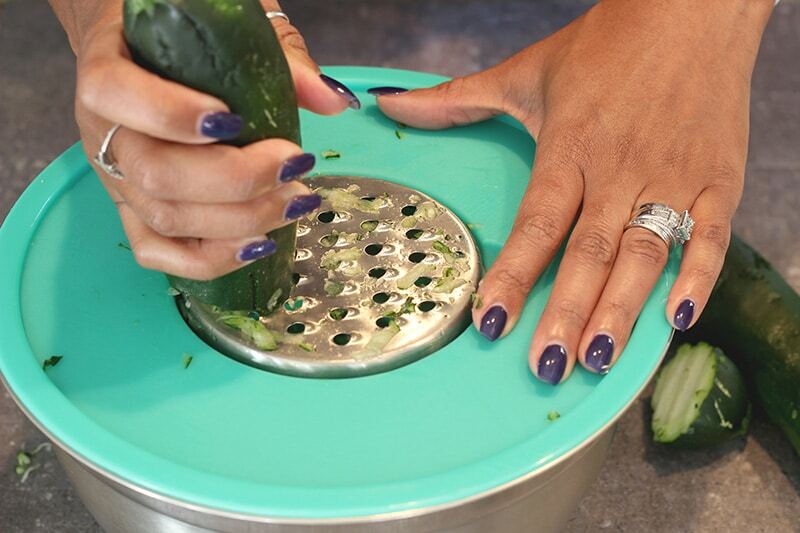 Using a grater, shred your zucchini. 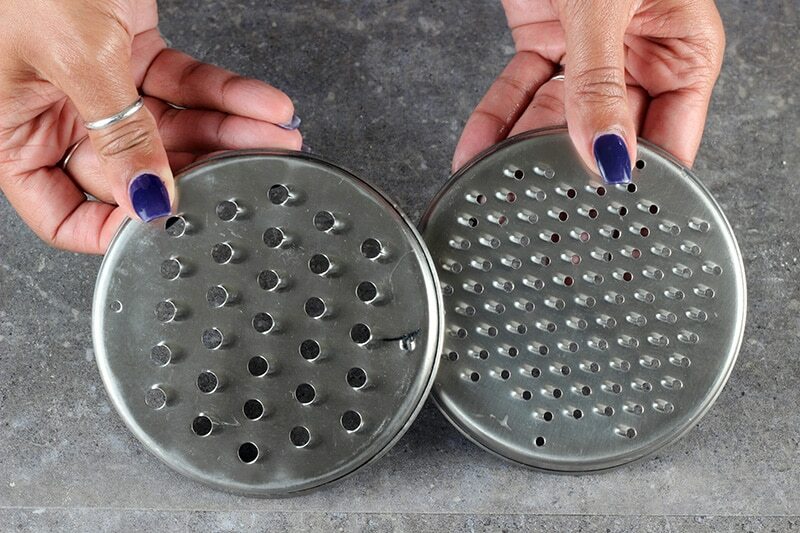 I opt to use the one with the larger holes. 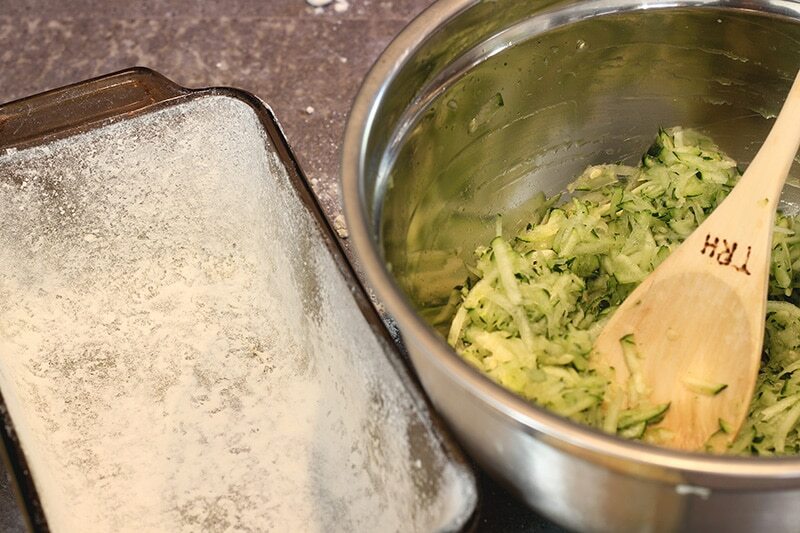 Because zucchini is a vegetable that holds water, using the smaller one made a mushy mess. How Many Zucchinis Do I Need To Make Zucchini Bread? For this recipe to get a full three cups I use about two nice size zucchini’s. If you have smaller zucchini's than you may need three. 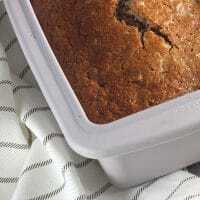 How To Make Zucchini Bread Easy and Moist? Start by shredding your zucchini. When measuring it, you’ll want to lightly pack it down to measure it. Preheat the oven to 350 degrees Fahrenheit. This way it can be warming while you prepare your batter. You can use two 8”x4” loaf pans or one bundt pan, making it more like a cake. Prepare your baking dish(es) by spraying or generously buttering the pan(s) and coating them lightly with flour. In a medium bowl, you’ll whisk together the dry ingredients – the flour, sugar, brown sugar, salt, baking soda, baking powder, and cinnamon. Then in a separate bowl, using a mixer beat together the eggs, applesauce, coconut oil, and vanilla. Making sure to mix well. 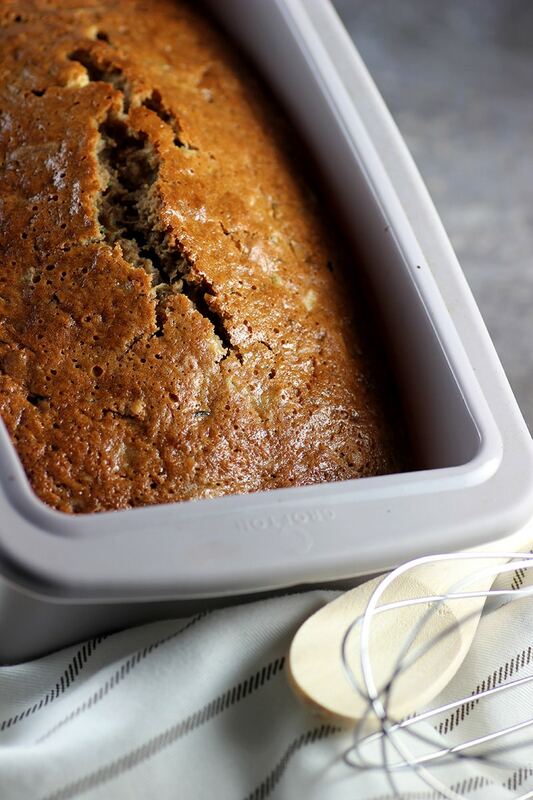 The applesauce in the zucchini bread combined with the coconut oil is what makes this especially moist. Slowly add the dry ingredients mixture to the wet ingredients. About 1/3 at a time. Continually mixing as you go until everything is fully combined. Then fold in the nuts. Using a rubber scraper or wooden spoon, combine them into the batter and mix well. Then do the same with your zucchini. Making sure the zucchini is mixed in well. 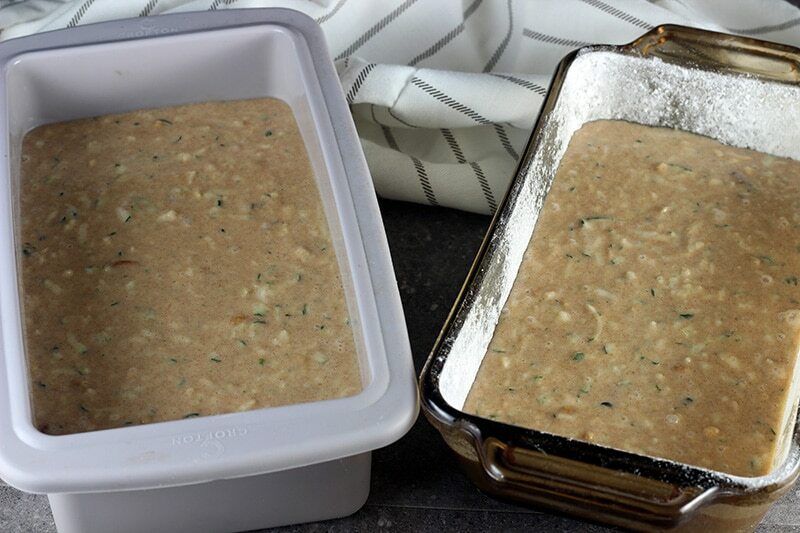 If making loaves, you can pour half of the batter into each prepared loaf pan. I made one in a glass dish and another in a silicone dish. While they both came out great, the thing I love about silicone dishes is the ease of removing baked goods from them. 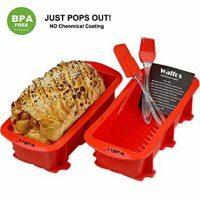 This silicone bread pan is similar to the one that I have. If making it in a bundt pan, then pour all of the mixture in the pan. You’ll need to bake your bread for 50 to 60 minutes. Time is dependant on the oven and the amount of zucchini added. But it is done when you insert a toothpick into the center and it comes out clean. Remove your loaves (or loaf) from the pan(s) and cool on a wire rack. Will I Taste The Zucchini? I remember when I was a child and first introduced to zucchini bread. First of all, I had no idea what zucchini even was. But furthermore, the thought of vegetables as dessert felt like a trick my grandmother was pulling on me. But to my surprise it was delicious. While I substitute coconut oil and apple sauce for the vegetable oil most recipes call for, I’d call it a stretch to say it’s healthy. I mean it has vegetables in it so it has to have some health properties right?? But I’d bet the amount of flour and sugar called for probably makes you break even on the health meter. My grandmother first introduced me to zucchini bread. She would send us home with a fresh loaf and one to freeze when we would visit. Yes, this stuff freezes and still tastes good! Friends… My mom DOES NOT just hand out those kinds of compliments. Especially not in the kitchen. Here is the recipe if you want compliments in your kitchen. A subtly sweet dessert made with vegetables. Shred zucchini and lightly pack it down as you measure it. set aside. 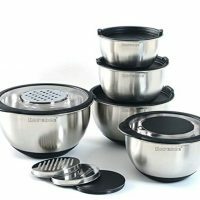 Using two 8”x4” loaf pans or one bundt pan, Prepare baking dish(es) by spraying or generously buttering pan(s) and coating lightly with flour. In a medium bowl, whisk together dry ingredients flour, sugar, brown sugar, salt, baking soda, baking powder, and cinnamon. In a separate bowl using a mixer beat eggs, applesauce, oil, and vanilla. Mix very well. Slowly add the dry ingredients (about 1/3 at a time) to the wet ingredients mixing as you go until fully combined. Fold in nuts, With a rubber scraper or wooden spoon, into the batter and mix well. Drain pineapple and fold it and the grated zucchini in. If making loaves, pour half of the batter into each prepared loaf pan. If making in a bundt pan, pour all of the mixture in pan. Bake for 50 to 60 minutes (depending on oven and amount of zucchini added) or until a toothpick inserted into the center comes out clean. Remove from the pan(s) and cool on wire rack. 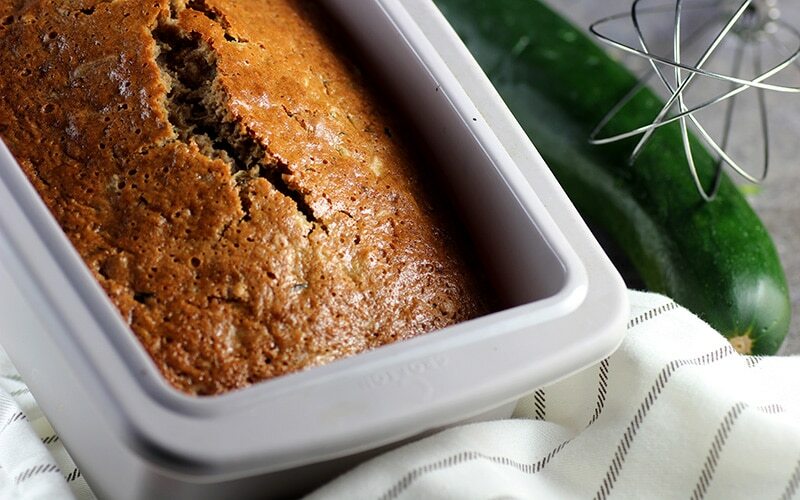 Interested in making Super Moist Zucchini Bread? Pin it or share it with friends for later using the buttons below.